The newest PES 2015 Live Update was made available by Konami this morning. The weekly actualization covers the week from February 9 to 15 and includes the latest stat updates, lineups and updated squads for all PES 2015 teams. A total of 369 players received stat boosts, while 34 players were downgraded. 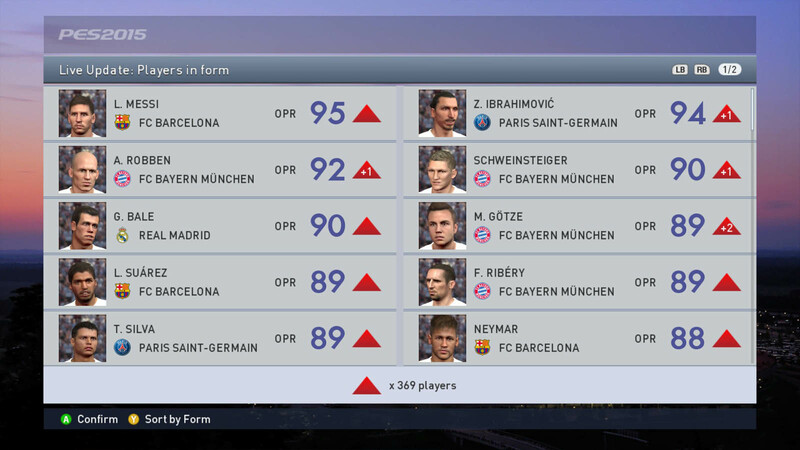 PES 2015 players owning the likes of Zlatan Ibrahimović, Arjen Robben or Bastian Schweinsteiger will like today's revaluations, as all three star players were upped by 1 overall rating point. Mario Götze of Bayern München also received a +2 boost and sits at 89 currently. FC Barcelona stars Lionel Messi, Luis Suárez and Neymar also received stat improvement, although too slim to affect the overall valuations. Another notable mention would be André Ayew of Marseille, who got a +4-boost and is now rated at 84 overally. Today's update only includes 7 transfers and one new player, after the large majority of winter transfers was already including during the last few weeks.